A program I was a part of – The ACE Mentorship Program – is a national organization that gives students hands-on experience as if they were actual engineers, architects, constructors, etc. This helps demonstrate what these careers are really like day-to-day in real life. The Ace Mentorship Program also gives students a chance to work during the summer as an intern at a firm. This summer I was the intern at Chicago Metal Rolled Project. As an intern, students get experience in an actual professional field. During my internship, I helped with the Design Build project alongside a CMRP estimator, Laurel Chavez. Students involved in ACE can also be part of Design Build during the summer. Design Build is a project where students transform ideas from conception to an actual project that they are able to visit and admire, as well as many people across the city. This year the summer Design Build students in Chicago had the Illinois Institute of Technology as their client. The University requested to have a project completed on campus next to a community garden. The students in ACE had an idea of creating a canopy that was leaf-shaped, which provides a nature theme to the garden. 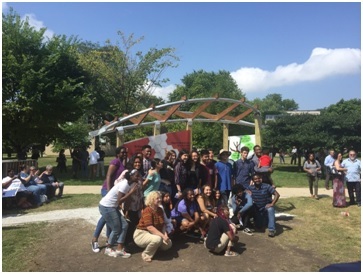 The students designed the canopy to use materials such as wood, aluminum, and steel. CMRP took part in this project by helping bend and fabricate the outer edges of the leaf shape, which were made with heat treated aluminum. CMRP made the student’s leaf design idea come to life with the group effort of employees in the shop and Laurel, who was able to do what was deemed to be “impossible,” possible. The company was tasked with creating three curved tubes that ran over the top of the main structure and braces to keep them in place. These tubes weren’t just typical bent tubes – two of them had flattened ends to create an area to connect the tubes. Designing the flattened ends was the most challenging part of the design. Using the different machines at CMRP made the rolling and flattening tasks much easier. Rolling machines, ram bending machines, saws, and punches were used to complete the job. Visiting the site with Laurel, we saw students working hard in the heat trying to set in place the final components for their big unveiling the next day. Some design issues appeared during the assembly – the tubes were sitting lower than they should have been. We helped reconstruct the canopy to achieve that desired design the students wanted in the first place. The design proved to be a success and is now at its final state located at the Illinois Institute of Technology. Here are the students at the final unveiling.